I have seen different joconde cakes over the years and have always been amazed at how beautiful and mysterious they are. “What is a joconde cake?” you ask; it is basically a decorative almond flavored sponge cake that is wrapped around layers of creamy fillings. The thing I have always loved most about them are the stunning designs that can be created in the sides of the cake. Recently, Amelia Carbine of CakeFu, posted some pictures on Facebook of joconde cakes she was making for an event. They immediately caught my eye and I started wondering if it was something I would be capable of doing. They looked difficult but Amelia promised to post instructions in her blog so I decided to take on the challenge and attempt them for my family’s Easter meal this year. I used Amelia’s cake recipe and found my own filling recipes. I was pleasantly surprised at how relatively easy they really were. I say “relatively” because they aren’t something that I would take on as a first time baking project. I would suggest that you have some baking experience behind you before attempting them but don’t let them intimidate you either. With the right tools, they really are easier than you might think. 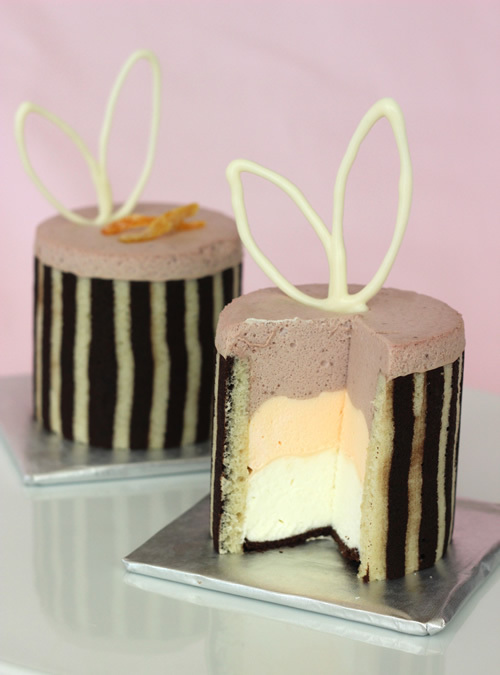 I filled my cakes with white chocolate mousse, orange passion fruit cream and pomegranate mousse. Here is what the inside looked like. Aren’t they beautiful? I topped them with white chocolate bunny ears and candied orange peels. I loved everything about them except for the pomegranate mousse. I’m not going to even bother sharing that recipe because I really didn’t like how it turned out. I made two different batches of it and one turned out clumpy and the other was smoother but the coloring in it was spotty and I wasn’t thrilled with the taste. If I make these again I will definitely search for an alternative. The white chocolate mousse and orange passion fruit cream were amazing though and made up for what lacked in the pomegranate mousse. Amelia’s recipe for the joconde cake was very tasty. You can find that recipe at this link. One note on the recipe is that the ingredient list calls for almond and vanilla extract but they are not mentioned in the instructions. Just add them after adding all the eggs in step 8. Also, she includes instructions for a compote and mousse. I did not use those since I was doing my own fillings but I am sure they are amazing since Amelia is an incredible baker. 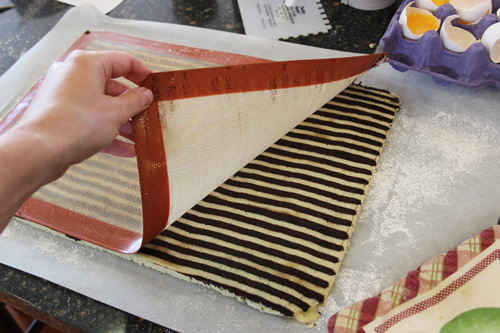 Here is the technique I used to make my stripped joconde cakes. After making the joconde paste, I used an angled spatula to spread a thin layer of the paste, about an 1/8″ thick, over a Silpat mat . You can’t see the mat in this picture because it is completely covered by the paste. 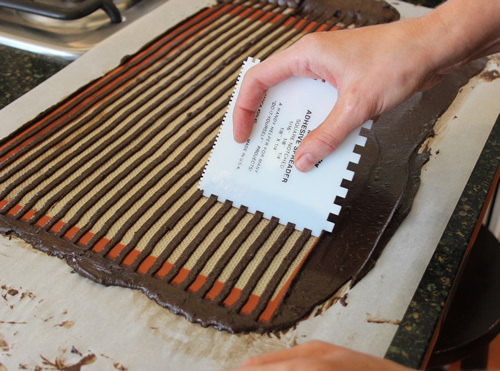 I have also seen that some people use parchment paper for this but I don’t recommend that because the parchment ends up creating lots of wrinkles in your cake while it bakes. I then took an adhesive spreader (you can get these at any hardware store) and dragged it through the paste, pushing the excess off the mat. I continued down the mat with the spreader until the entire mat was stripped. 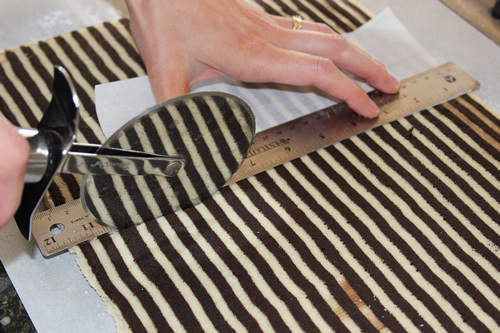 To make sure you keep your stripes even when you are starting on a new row, place the top grove of the spreader into the bottom stripe from your last row as you start your new row. You can see in this picture that I laid a large piece of parchment paper underneath my Silpat mat to make clean up easy afterwards. When I finished the design I carefully picked up the mat and placed it in a baking sheet then stuck the whole sheet in the freezer for about 20-30 minutes. 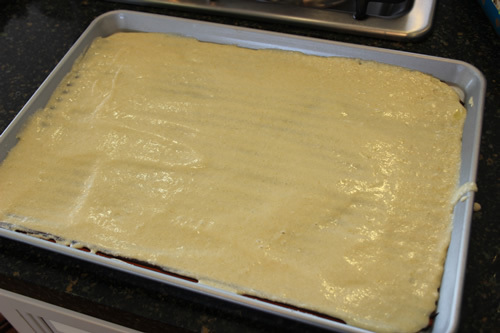 While the paste was freezing I preheated the oven to 450 degrees and made the sponge. I then removed the baking sheet from the freezer and immediately spread the sponge on top of the paste in another thin layer. I placed the baking sheet in the oven and baked for 7 minutes. This is a fast baking cake. You know it is done when you can touch the top and it bounces back at you. While it was baking I laid out a clean sheet of parchment paper on the counter and sprinkled it with powdered sugar so that the cake could easily be removed from it later. When the cake was done I allowed it to cool on a cooling rack for about 5 minutes then took a knife and ran it along the sides of the sheet to make sure the cake wouldn’t stick. 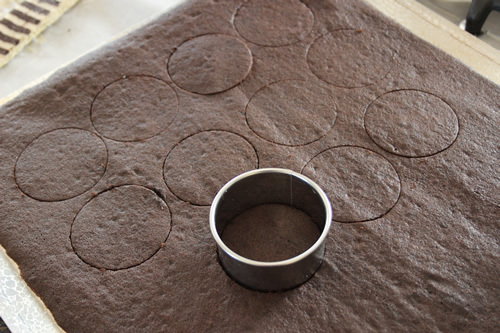 I then flipped the whole thing onto the parchment paper, removed the baking sheet, then lifted off the Silpat mat. Look at the stunning design! I was so excited at this point that I was literally jumping around the kitchen. While the cake continued to cool I prepared my molds. Ideally you would use ring molds to form the cakes in but I didn’t have any so my husband cut up a piece of PVC pipe for me and it worked perfectly. You can make joconde cakes any size you want. Amelia made very small ones for her event and I have also seen an entire large cake wrapped in joconde. 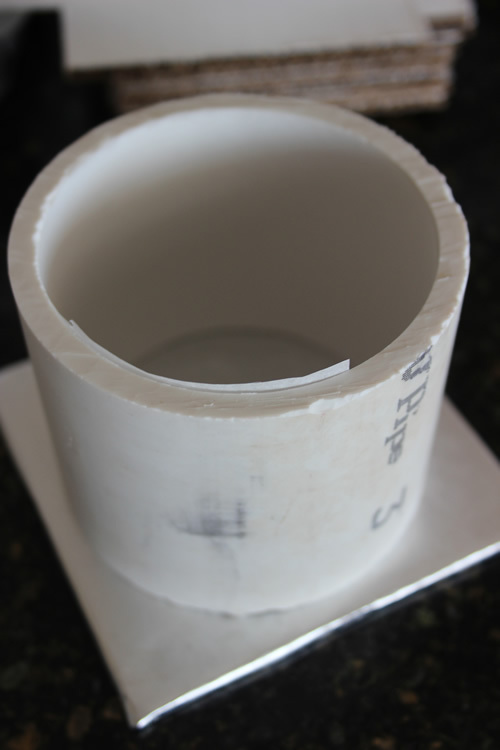 For my desserts I used 3″ PVC pipe cut into 3″ lengths. 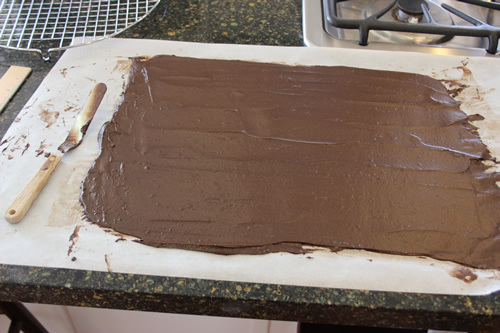 For the base of each dessert I cut up a cake board into 4″ squares and wrapped each square in some cake foil . 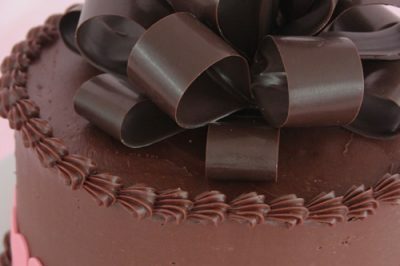 I then placed a PVC pipe on top of each cake board and wrapped a piece of waxed paper on the inside of it, overlapping the ends. You can sort of see it in this picture. I tried to cut the waxed paper even with the top of the pipes so that I could later smooth the mousse evenly with the top. Next I made a pattern for the cake by placing a piece of parchment paper inside the pipe and measuring it so that the ends over lapped just slightly. That gave me the length. I then measured the height at 2 1/2″. I used that height because the pipe was 3″ tall and I wanted some of the pomegranate mousse to stick up over the top of the cake. I used the pattern to cut out my cake pieces from the large sheet of cake. I laid the pattern down on the cake then placed a metal ruler on top of it to hold it in place while I used a pizza cutter to cut out the strip of cake. I wanted vertical lines so I laid my pattern in the opposite direction of the stripes. If you want your stripes to be horizontal you would just lay it in line with the stripes. Joconde cake, like all sponge cake, is pretty flexible. 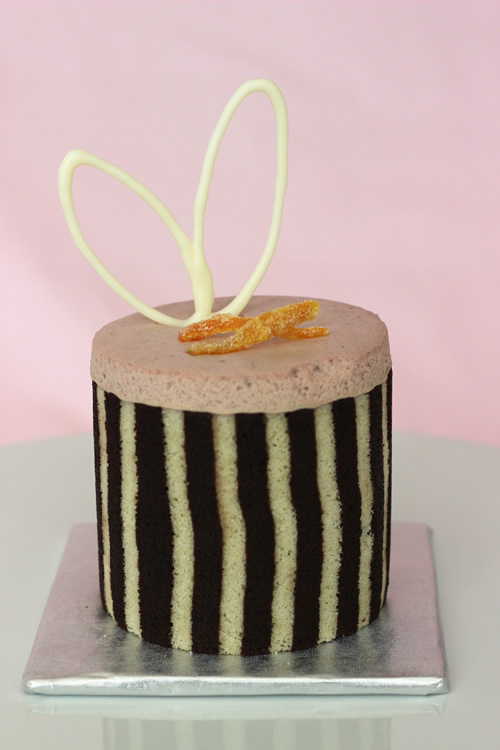 I took the strip of cake and wrapped it inside the mold, overlapping the ends and pressing them together. I did have some problems with some of my cakes coming apart at the seams later on so I think I might try adding a dab of melted chocolate to the ends next time to hold them together better. I baked up the remains of my joconde paste by itself and used this as the bottom of my cakes. 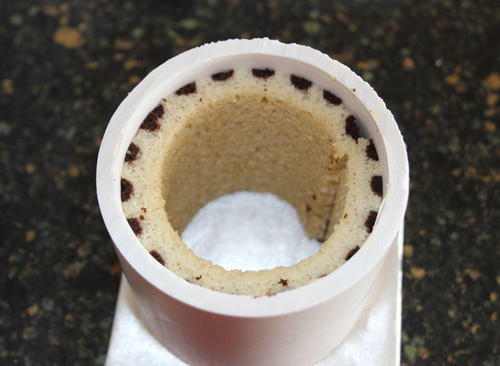 I used a circle cutter to cut out cake circles and placed them at the bottom inside each of the pipes. Now it was time to add the mousse fillings. For the white chocolate mousse I used the recipe for the mousse base from my blog entry on White Chocolate Mousse Cake. Click here for a printable copy of the White Chocolate Mousse filling recipe. To easily fill the cake, I placed the mousse in a decorating bag with a round tip and filled the cake about one third of the way up. When all the cakes were filled, I placed them in the refrigerator to set up while I made the orange passion fruit cream filling. I had planned on sharing this recipe for you but I have lost it. I had it on my phone and have spent the last two hours searching my browser history trying to find it again but haven’t been able to. I will be sure to update this if and when I find the recipe. Once again I filled a decorating bag and placed this filling on top of the white chocolate mousse, another third of the way up the cake. Again they went into the refrigerator while I made the final filling, the pomegranate mousse. Like I said before, I’m not going to bother sharing that recipe since I wasn’t happy with it. When I added the final mousse layers I filled them slightly over the top then used a spatula to spread them evenly along the top, scraping off any excess over the side of the pipe. I left them in the refrigerator over night to set up completely. 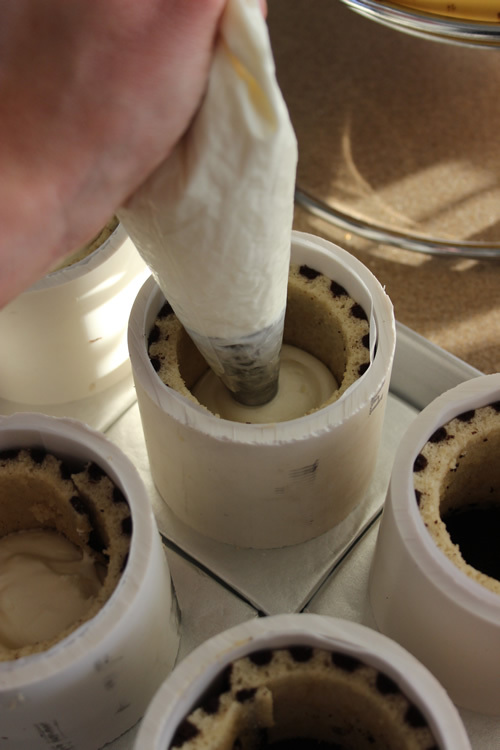 The next day I carefully removed the pipe molds and waxed paper to reveal my beautiful cakes. Since it was Easter I melted some white chocolate, placed it in a decorating bag fitted with a #3 round tip , and piped out bunny ears on waxed paper. You can read more on making chocolate embellishments here. Once they had cooled completely I placed them in the cakes. 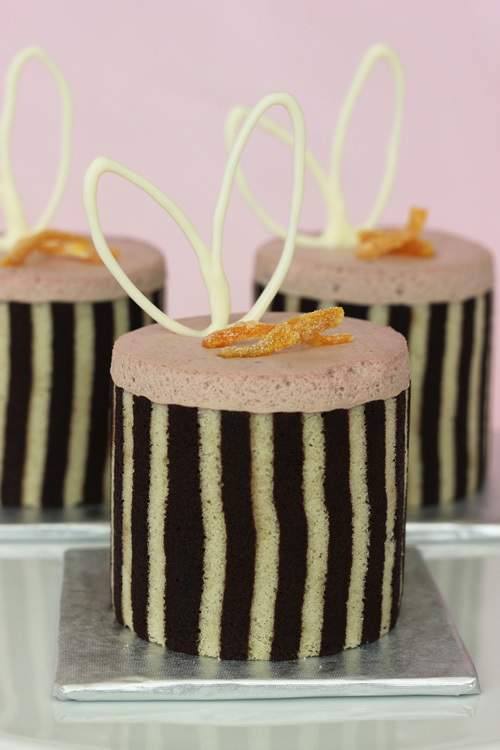 Finally, I added a couple of pieces of candied orange peel to each cake. I had made the candied orange peel the day before. It takes a little bit of time so be sure to have it done ahead of time. Here is a link on how to make candied citrus peels. And, once again, here is the final result. I was really happy with my first attempt at these fascinating little cakes. I can’t wait to try a new design next time. I hope all the steps didn’t scare you away and that you are willing to try your own joconde cake. If you do, please share a picture of it on my Facebook page. I love seeing your creations. Thank you so much, i cant wait to try this. What should i do if i want my paste to be different color like yellow & sponge grey? Thank you!! I will be making this in the july for my birthday ;).. Will definetly pose picture on ur FB page. 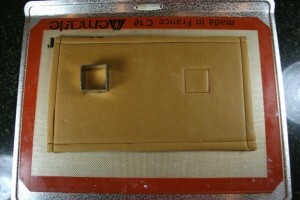 Usually, The ring molds are smaller in sizes. I am looking for something which is 3″ length and 8″ wide. Any recommendation? Toni, that sounds wonderful! Great idea to use the frozen berry insert. I am going to have to remember that for the future. Can you give me the link to your website so I can see it? I would like to see your cake also. OMG! Gorgeous! What did you use as your mold? Thank you Pat. I molded it in a piece of PVC pipe as you can see in the pictures. Hi, I had some trouble with the cake coming apart as I was bending into a cylinder 🙁 any advice on how to prevent this? Hi Dani, I’m not sure if you mean that the cake cracked on you or if you mean the ends separated once you removed it from the mold. If it cracked on you, that probably means that it dried out too much from either being over baked or sitting out too long. If you mean that the ends separated, I had that happen to a couple of mine after I unmolded them. I am thinking that next time I might add a little dab of melted chocolate as a glue to attach the overlapping ends together. I haven’t tried it yet but I think that might help. 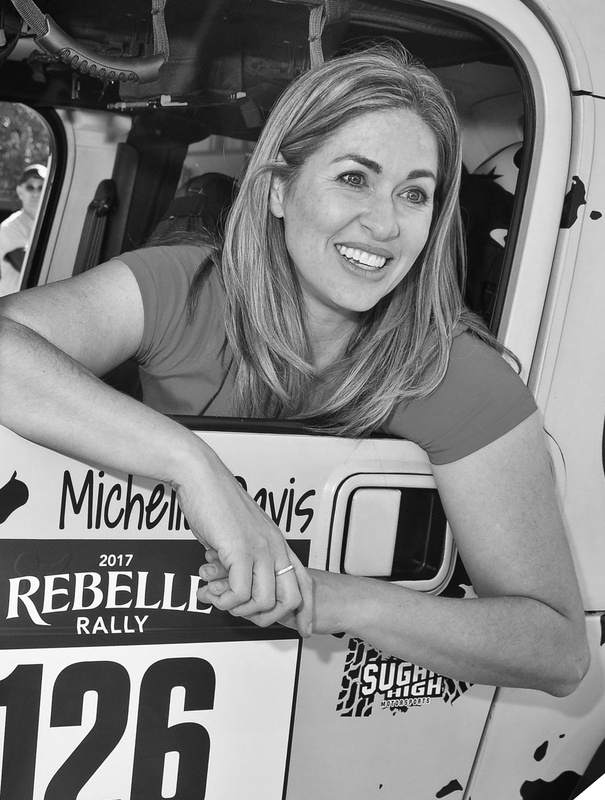 Also, make sure that you are cutting them long enough to overlap the ends. Does this answer your question? Yes 🙂 thank you. It was the first one, cracking on me as I was putting the cake into the molds! I love baking and have been so intimidated by these entrmet/jaconde desserts but with your detailed instructions I am confident I would be able to pull this off! I have book marked your site and plan on making the one above this weekend. Thank you for sharing this!!!! You are very talented!!!!!!!! I am so glad you found this tutorial helpful. I hope it turns out great for you. They are really fun to make and not nearly as intimidating as they appear. You should post a picture on my Facebook wall when you do it. I would love to see it! Very nice looking. Very impressed. I’m a big fan of cooking as well as baking and have upped my baking skills to a degree, but this looks like total fun. Breaking down the pieces really helped in understanding the deconstruction. Once the jaconde sponge has been cooled would it be alright to freeze it? Hi Amanda, I haven’t done it before but I don’t see why you couldn’t. I’ve never had any problem freezing any type of cake. 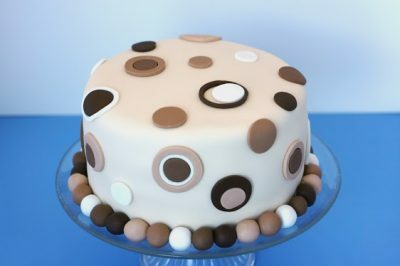 Can I make decorative sponges uses normal sponge recipe as i can have any nuts???? Sorry Steven, I have been traveling and am just now seeing this. I am not certain but I can’t see any reason why that wouldn’t work. Give it a try and let me know how it goes. Good luck! Hi Sophie, if you look at the recipe that is in the link I provided the chocolate part is listed as the Joconde Paste in the recipe. Here is a link to the recipe again. You can scroll down the page to find it. Hope that helps. “Here’s my take on it. I’ve never tried making jocondes ahead of time. The problem that she will run into is the fact that they are such a thin layer that they will be extremely likely to dry out. Also, they are the most pliable when they are a just cooled out of the oven so saving them as sheets is maybe not the best idea. If she wants to try making them ahead I would recommend pre shaping them (without filling them), putting them in a very airtight container and then freezing them. Then you can bring them out and fill them on the day of the event. I am not really sure how to alter it to improve it for you. Are you at a high altitude? That could be affecting it and I would use a high altitude baking alteration chart for your altitude to make some changes and see if that helps. I am at 4500 ft above sea level and usually have to alter many of my recipes but I didn’t with this one and it turned out fine for me. It has been a while since I made it but, as I recall, the chocolate part of the joconde may have been a bit drier than the rest of it. As for flavor, most of the flavor came from all the fillings so I don’t remember that being an issue. I hope you can figure it out because it is such a neat dessert to make. You can try brushing your joconde with simple syrup flavored to match or complement your filling. This also helps the cake to stick togetger a bit better too. Thank you so much for your input Lala! That is very helpful information.